I often find myself correcting environmentalists about their mis-representations of certain aspects of the scientific consensus on climate change. For example, after Hurricane Katrina trashed New Orleans, I think that hurricanes seemed to be a politically useful topic for getting the danger of climate change across to society. So they used it in spite of the (still) ongoing scientific debate about how hurricanes will change with climate change. And, likely by random chance and natural variations, we’ve had a record-long period without a major hurricane landfall in the U.S. (> 2200 days). Sadly, as a result, some people start to question the science of climate change as a whole. The focus on disasters distracts from a more obvious, simple and highly personal question about climate change: Is it morally acceptable that we are changing the planet’s atmosphere and weather in irreversible ways? Snowpack in the mountains of New York State is projected to decline sharply in future decades due to global warming. The black line shows historical snowpack and the colored lines show modeled snowpack for the same period, and also for future decades. Credit: NY State ClimAID Report, 2011. The figure above shows the “normal” observed snow base in the Adirondacks (eastern upstate New York), based on the period from 1971-2000, along with model-based estimates of normal and future snow base. The model isn’t perfect, but the general result has higher confidence than most other predictions for the changing climate — we will have a lot less snow in mid-latitude regions like New York State in future decades. Reduced snow cover means more soil visible in wintertime, so in more ways than one, we are “soiling our own nest”. 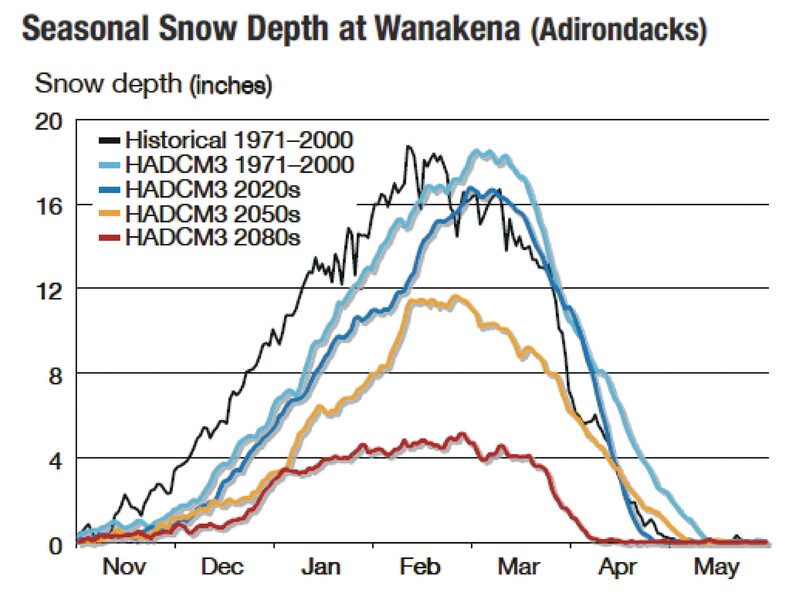 The predicted reduction from the recent past “typical” wintertime peak snowpack of 16-20 inches to a future of about 4-5 inches would be a result of warming temperatures — because of human interference with the climate system, there will likely be no skiing anymore in the Adirondacks later this century. Looking back in a few decades, will we be proud of a society that has behaved responsibly, and taken steps to avoid severely changing the global environment? Or will we be prepared to answer these tough questions for our children and future generations: Why isn’t there enough snow to ski in New York State anymore? Why are there no longer any coral reefs? (due to ocean acidification and warming). And so on … Will we respond to this moral problem by pushing hard toward renewable energy and a more efficient use of energy, with the many added benefits of having energy independence? Or will we not do anything because we are scared to harm our economy? This entry was posted in climate, opinion and tagged Adirondack, Big Tupper, climate change, Dewey Mountain, global warming, Lake Placid, McCauley Mountain, Mt. Pisgah, New York, ski, snow, snowpack, Wanakena. Bookmark the permalink.